Masters of Fine Art Degree programme (MFA) at Gray's School of Art in Aberdeen. Gray's is part of the Robert Gordon University and one of the four 'Scottish Schools' of Art. for the Masters Degree in 2010. 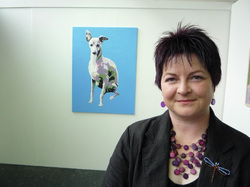 My study was based on the 'Dog Image' in its contemporary context and followed a journey of discovery through my photography, drawings and paintings of my own favourite breed - the Italian Greyhound. My study involved close observation and then contemporization of the image of this very elegant and beautiful creature.